I'll admit it: I have been pretty tough on Activision ever since they took over the Guitar Hero series. Cranking out sequel after sequel has filled shelves to the point of saturation. 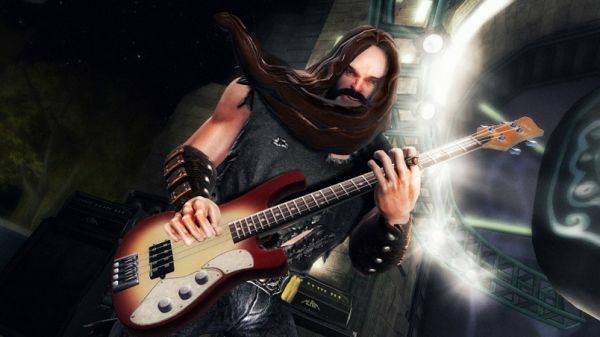 Activision's stance on importing songs and compatibility of DLC is hardly user-friendly. For some time, the entire series has become derivative, not innovative. However, there are many things about Guitar Hero 5 that lead me to believe that Activision is changing their ways for the better, at least in a few of these areas. Guitar Hero 5 is a solid title, with some notable additions that make for a truly great co-op experience. The biggest changes to Guitar Hero 5 are all related to accessibility. The whole interface has been streamlined and is incredibly easy to use. No longer will you be switching back and forth awkwardly between different screens. Things like picking an instrument and choosing a difficulty were a bit unwieldy in previous games, but it's a snap in Guitar Hero 5. Adding to the ease of use is the fact that you can mix and match instruments, in all modes. Want three drummers? If you have the instruments for it, no problem. Sick of playing boring bass parts? Switch to two guitars instead. 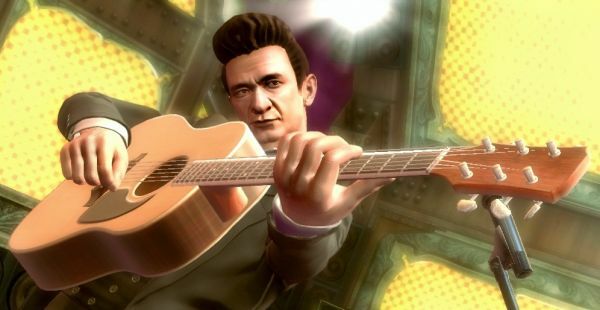 You can go "Barbershop style" with four singers, and there's even an achievement for it! We find ourselves swapping instruments often, and in Guitar Hero 5, it's easier than ever. You don't have to waste time backing out all the way anytime you want to add or drop a player, either. These features were sorely needed, and add considerably to Guitar Hero 5's appeal. The art style of the game has changed considerably. When you usually think of Guitar Hero's style, the over the top characters and crazy venues all come to mind. 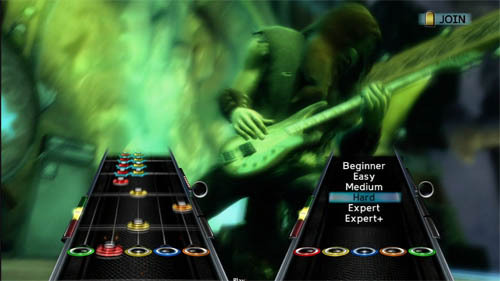 In Guitar Hero 5, the "extreme" elements have been toned down. The new characters models are more realistic, and far more detailed than ever before. The different locations for your band to rock out in are a bit more grounded in reality, too. One nice touch was the fact that the venues are less static. From song to song, different fireworks or other effects change things up a bit, whereas before, any changes were left to the encore. Even the menus are more subdued; the album art-like scribbles are noticeably scarce, with a few exceptions when the game starts up. I won't speculate as to the cause of this change in style, but Guitar Hero 5 certainly looks different, and more like Rock Band now. Other major changes include the game types. When Guitar Hero 5 first begins, a random song starts up. There are two options: Play Now and Main Menu. Play Now puts you right into a new mode called Party Play. While the song plays, you can select your instrument, difficulty, and other options. This all happens in real time, without pausing. When you're ready, your notes start scrolling by. Want to add in another player? Just turn on a controller and join. There's no stopping, backing out, or anything; it's all going on at the same time. At the end of a song, you are rated on your percentage and note streak, then another song fires up immediately. If you want a different song, you can skip and get a new random song, or go to the menu to choose a favorite. You can even leave the game going without players, in a jukebox mode of sorts. Party Play is the best new addition to the game. Dropping in and out, without pausing, is the most co-op friendly addition to the music game genre in a long time. It's worth noting that all of the songs are available from the get go in Party Play and Quick Play. The only difference between the two, really, is that high scores and such are saved in Quick Play mode. Unfortunately, this comes at the cost of the on-the-fly drop in and out feature. Quick Play seems to be a middle ground of sorts between Party Play and Career Mode. I really don't see much reason to even have a Quick Play mode; if you are interested in scoring, why not choose the more robust Career Mode? Speaking of Career Mode, it has been revamped significantly as well. No longer are there Solo Careers and Band Careers, it's just one shared career. If you are playing by yourself, and want to add in another player, all you have to do is back out a screen add them in. I'd rather have seen the seamless drop in and out of Party Play here, but it's still far easier to mix and match players in Career mode than it has ever been. As with the latest GH games, venues unlock with the accumulation of stars, which means you don't have to beat every song to continue. In fact, there's quite a bit of choice. Each venue has a handful of songs available to begin, and as you play, more new songs unlock for you to choose from. This is a nice touch and allows you to skip songs that are too hard, or you just don't care for. Page created in 0.2247 seconds.